To become a central resource on the Internet on all aspects of Vedic Mathematics. An introduction and basic tutorial. 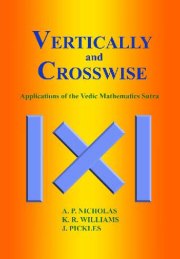 Resources about Vedic Mathematics and where to get them. Up to-date news on what's happening. Information on who is doing what. Articles on topics of interest. To help create and support a community of those people interested in Vedic Mathematics. To provide comprehensive teaching material on Vedic Mathematics. Basically we have marked all of our pages as suitable for all ages and the icra labels have also allowed us to mark the chatroom as unmonitored. The content of our web site is clearly described by the elecronic content rating index logo. Titles rated "ALL /i (All Ages LEVEL 2)" have content that is generally most suitable for persons of all ages. These titles generally contain content which is educational, minimal to medium level of abrupt activity, and is family friendly. Although this content is for all audiences, Although this content is for all ages, it is generally most enjoyed by persons ages thirteen and above.